Our port today is Eden, the world’s third deepest natural harbor. We are anchored off shore and took the tender in to the wharf. 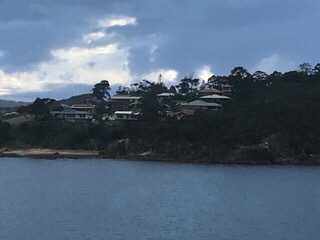 The bay we are anchored in is called Twofold Bay. It is a renowned sanctuary for whales during their migratory journeys to and from Antarctica. 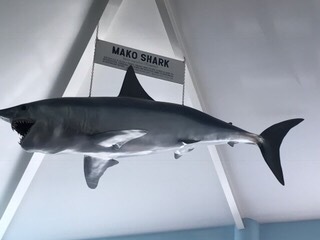 It has quite a whaling history which I will explain later in this post. The Eden wharf is walking distance from the pier we arrived at. It was a pouring rain so instead of walking to the town which was about 1/2 mile, we took the shuttle. I really wanted to have a nail appointment but the one and only salon didn’t have an opening until this afternoon, too close to when we are leaving. Too bad, it would have been a nice rainy day activity! 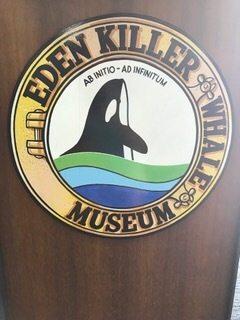 Instead, we went directly to the attraction we both wanted to see, the Eden Killer Whale Museum. 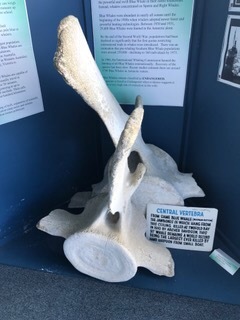 There we saw the skeleton of “Old Tom” and heard one of the volunteers explain the story of Old Tom and his pack of killer whales that worked with the local whalemen of Twofold Bay for decades during the later 1800s and early 1900s. We also watched the excellent film they have here before exploring the rest of the museum. This whaling operation was unique in that there was cooperation between the whalemen and a pack of killer whales. They returned each year and were identified individually by special markings. Tom, Hooky, Humpy and Stranger would herd the baleen whales into Twofold Bay. They would alert the whalemen of their prey’s arrival by “flop-tailing”, (thrashing the water with their tails) and the chase would be on. After the whale was harpooned, some of the killer whales would expedite its death by rolling over its blowhole to stop it from breathing, and others would swim below it to prevent it sounding (diving deep). 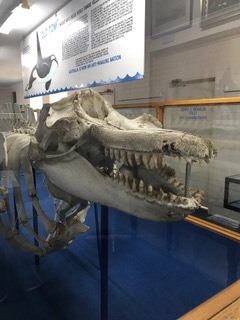 When the whale was dead, the killer whales would take the tongue and lips as their reward and leave the carcass for the whalemen to bring ashore. Whaling from Twofold Bay continued until the late 1920’s. The last whale was taken in 1928 and there is no whaling allowed in Australia today. Old Tom’s body was found floating in the bay on September 17, 1930. 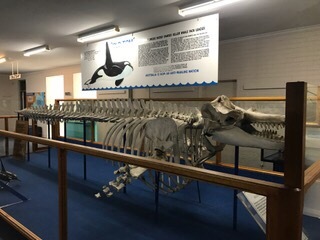 His remains were kept and his skeleton mounted to become the first item in the collection of the Eden Killer Whale museum. 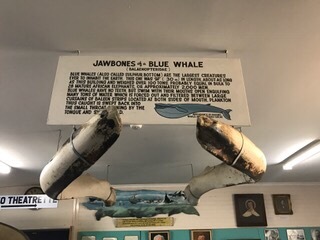 Other displays include the rowboats the whalers used and some of the vertebrae and jawbones of the whales. There is a lot of WW I history here too. All in all, a worthwhile and educational visit. After our visit to the museum, the sun was out so we took a walk through the town, which is just a few blocks of shops and cafes with a hotel and some apartments. It is built on a hill overlooking the beautiful harbor. There were many dark clouds with a forecast for more rain, so we came back to the ship. 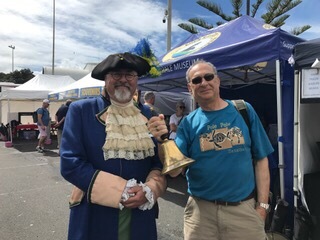 Before boarding the tender, we talked to this “town crier” who told us more of the history of the area. Like in some of the New Zealand towns, there were many volunteers everywhere to give us maps and assist us. Very friendly and helpful, although here you really didn’t need a map! 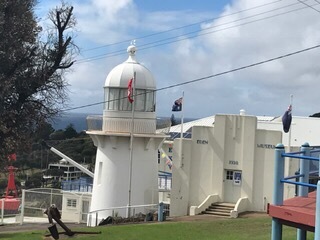 This entry was posted in Australia, March, World Cruise 2. Bookmark the permalink. Just loving following your trip around the world. I love that you always find something unusual to write . Loved the story of ‘Old Tom’ – amazing.